1971 Pontiac GTOs. Lot 52 of 58. CLICK-> Green 1971 Judge 455 HO hardtop drawing by Dave Jeffries. We've got his drawings for each of the 11 GTO years! This was our Picture Of The Week for 4/15/01. CLICK-> Silver 1971 GTO hardtop owned by Bill Morris from Loudonville, Ohio. This was our Picture Of The Week for 9/2/01. 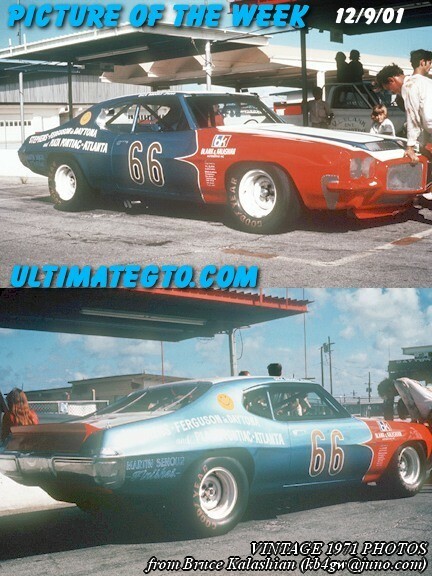 CLICK-> 1971 GTO NASCAR owned by Bruce Kalashian. This was our Picture Of the Week for 12/9/01. Look at this double picture of the car from when it was a Picture Of The Week on this web site. QUESTION: What ever happened to the car? ANSWER: The car was sold to Terry Link who raced it a few times in Nascar but crashed it badly. I don't know if he ever did anything with it then, I think he junked it. QUESTION: Got any pictures of it being assembled? ANSWER: I took some pictures during the building of the car. They are all in black and white. I just did it for a history record, I think I still have them. It shows the frame in the Jig and the body cut up and all the different stages of construction. Each one would require an explanation when you are looking at it. QUESTION: Was the body all metal? Or fiberglass? ANSWER: The NASCAR rules at that time required that it be a real car from the factory and modified for safety. Of course safety included the suspension and frame strength and the body shape to accommodate the tires. So it was all-metal. The floor boards where put in to fit the rollbars and to isolate the fuel cell from the driver compartment, fire being the concern there. There had to be no---no-- holes from the engine compartment or from the trunk. A hole in the fire wall could burn the driver on the leg or something like that just because of the intense heat, like hot air during the race! QUESTION: How much did it cost to enter a race back then? ANSWER: It cost us about a grand to move from one track to another. I think the entry fee was $500 or so but I don't recall for sure. Then travel costs and tires. The tires are different for each track. QUESTION: Got any old NASCAR paperwork to scan such as entry forms? ANSWER: Sorry no paperwork. All that went to NASCAR so we could enter! QUESTION: Who was on your racing crew and what were their backgrounds? ANSWER: Vernon Blank was my partner, he really was the technical one at the time, and I had regular mechanic experience but no racing until we formed our corporation. Vernon worked for Smoky Yunick a number of years before going out on this venture. Richard Brooks drove the car for us. He later did well in NASCAR on his own and retired with an auto dealership. Frank Habelka helped us with some of the construction and at the racetrack along with Terry Link. We were a low budget operation and had to gather help at the track. QUESTION: Got a list of all your old sponsors? ANSWER: Our sponsor was the local dealer, Stevens Pontiac who provided the car, Martin Senour Paints, part of NAPA parts. By the way it started out as a Tempest body and we put all the GTO parts on it as it was built. No need to tear up a perfectly good GTO, which is more expensive and a waste. Plaza Pontiac in Atlanta helped out too with the purchase of the car. Pontiac Motor Division helped with some of the technical stuff. Franklin Rear Ends made the rear axle, it had to be the exact width of a production car and the tires and wheels were too wide to go under the stock body.The rules also required floater hubs for safety. We manufactured the front suspension, which got changed over to the Holman and Moody front clip after a couple of races, worked better. The rear end suspension started out as a "Watts Link" and was changed to the Chevy pickup trailing arms too because they worked better. QUESTION: Who are the people pictured in the "Picture of the Week" photos? ANSWER: The small girl sitting behind the car is my oldest daughter about 9 ys old, then the man bending over the hood is Frank Habelka. The man facing away from the car beside Frank is Varnon Blank. The guy behind the picture is me, of course you can't see me, ha ha. QUESTION: Was was Frank doing while he stood at the front of the car? ANSWER: We were shaking it down for the first run after being built. I think we ran it 4 or 5 laps and brought it in to look it over, oil leaks, water leaks and anything else. After that we went out again and the transmission seized (Got Real Sick). We found out that the Muncie transmission could not be run at that speed without lots more clearances in the counter shaft and output shaft. See, race cars are stock at this time but need lots of help to make them do the job. QUESTION: Do you know what date the pics were taken? ANSWER: The exact date I don't remember but it had to be before Labor Day, maybe middle August because we took it to Darlington for it's first race. QUESTION: That is an interesting spoiler on the trunk. Who came up with that idea and what was it made of? ANSWER: The spoiler was hand made by us. It was made to meet the rules that NASCAR allowed at that time. Length, width, height, and angle. We had to fit a template at the race track. All cars had to. The template was made by NASCAR from a stock car. Hood, Roof, Deck + template. There was also a level built into the template that allowed the angle of rake for the car. If it didn't fit, then back to work before we could get on the track! QUESTION: What part of the country do you live in now? ANSWER: I still live in Daytona Beach,FL I have been here all along since 1952. I have closed my shop after 29 years. QUESTION: Have you ever owned an interesting Pontiac or GTO other than the race car? ANSWER: Nope! I have had Chevys since I started working for the dealer in 1961. As a matter of fact I still have a '67 Impala that I bought in 1967 late in the year when the first owner traded it in for the new '68 model, so I bought it right then and have owned it even since. I restored it in 1992 and have been showing and cruising with it till now. QUESTION: Do you think that Pontiac (GM) made any mistakes with the way they handled their racing program back then? ANSWER: They didn't have a racing program at that time. GM pulled out of racing because of the public outcry for safety and the government pushing for the horsepower race to stop! Politics is in everything. Before this all came about, Pontiac was racing with Smokey Yunick and Fireball Roberts, doing quite well I might add, thanks to Bunky Knudsen who was head of Pontiac Motor Division. He saved Pontiac with his racing program because Pontiac was in the dumps and had a reputation of an "old fogeys" car. He was the one that let the GTO program go ahead and that made lots of money and started the horsepower race. From that time on the muscle cars were born, GTO being the first. QUESTION: How did you get into racing this car in the first place? Who's idea was it? ANSWER: Well---that is a long story. It was Vernon's idea along with some of the guys up north that wanted Pontiac back in racing. It took a while but it came together with not enough funding but we jumped in with visions of grandeur and started to build the car. QUESTION: How fast did the car go in testing at the tracks? ANSWER: When we ran the car in shake down we never did get any times with it because of the transmission seizing. When we ran at the track we were competitive but on the slow side of the field. Chassis and gear was a problem at first. We had experimental forged rods in the engine and when I pulled them out of the box the data told us that they would go through so many cycles of stretch at so many RPM. Wouldn't you know for a 500 mile race to run the 366ci engine we needed to run 7600 RPM but the rods would not make enough cycles so we had to gear high and run the engine at 7200 RPM. That ran us short in horsepower because the horsepower was at 7600 RPM! See, racing gets complicated and you never know what is going on with the other teams. I'm sure that is the case today too! CLICK-> Burgundy 1971 455 GTO owned by M Johnson. This was our Picture Of The Week for 1/20/02. This GTO has a white vinyl top, rear spoiler, hood retainer pins, and a hood tach. CLICK-> Torch Red 1971 GTO hardtop from Tom Savage from Westfield, Massachusetts. This was our Picture Of The Week for 2/17/02. Tom adds, "This GTO that has taken me 3 years to complete. The car went through a total ground off restoration. Equipped with a 455, Turbo 400, Posi, 2 1/2 exhaust, Hotchkis front and rear suspension with 1 inch drop springs. Runs on rails. The picture really doesn't do the car justice but it's painted 2000 Corvette Torch Red with a Sandalwood interior. It's a 2 owner car with AC and rare on the shift coluum. It's documented by PHS. The wheels are American Racing Torque Thrust II, 17x9.5 in the rear with a backspacing of 5-1/2, the fronts are 17x8 with a 4-1/2 inch backspacing. Tires are Firestone SZ50 Firehawks 275/40ZR17 in the rear, the fronts are 245/45ZR17. The great thing about this combination is that no sheet metal work is necessary, and the tires fit inside the wheelwell. They simply bolt on! I have yet to have any problems with tire rub and I live in New England where there are plenty of pot holes to dodge." CLICK-> Tom sends us some updated pictures of his Torch Red 1971 GTO hardtop. Tom is a member of the GTOAA and Pioneer Valley GTO Association. CLICK-> Torch Red 1971 GTO hardtop, rear end view. CLICK-> Torch Red 1971 GTO hardtop, engine view.